home < articles < How Can Babies Do Yoga? If you’ve never heard of “yoga” before or been to a class, you might be wondering what it’s all about and how do babies fit in? Yoga originates from ancient India, it’s a sanskrit word translated as the union between the self and the spirit. It’s an ancient form of exercise that focuses on strength, flexibility and breathing to boost physical and mental wellbeing. Babies and Toddlers can reap many benefits to it such as improved sleep, delivering oxygenated blood to the brain, Myelinisation, aiding development of the nervous system, promoting general well being and improved digestion just to name a few. 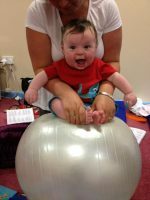 Mothers can expect to build their confidence in handling baby, experience bonding time including gentle exercise and relaxation. Classes use yoga inspired stretches to help little ones achieve developmental milestones such as rolling over, crawling, sitting up as well as helping with specific issues such as colic, sleeplessness and constipation. Lola has been practitioner yoga for over 20 years. The Kalma Baby brand holds a Gold accreditation from the Children's Activity Association, the only regulatory body for children's activities in the UK.